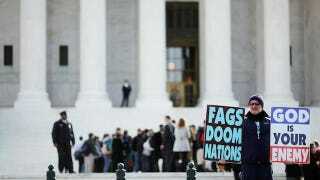 Good news for free speech, bad news for anyone who doesn't want their family's funeral disrupted by "God Hates Fags" degenerates: The Supreme Court has overwhelmingly upheld the right of the Westboro Baptist Church to protest outside military funerals. The father of a Marine who had died in Iraq, Matthew A. Snyder, had sued the Topeka, Kansas-based "church" for infliction of emotional distress. He won in court, but subsequent appeals took the case to the Supreme Court, which ruled today 8 to 1 in favor of Fred Phelps and his loathsome crew. Still, they are pretty manifestly covered by free speech laws, acknowledged by Chief Justice Roberts in his opinion and argued in friend-of-the-court briefs from press groups and The New York Times. Only Justice Samuel Alito dissented, saying fighting words are not protected by the First Amendment and writing, "In order to have a society in which public issues can be openly and vigorously debated, it is not necessary to allow the brutalization of innocent victims." Perhaps the most nonsensical reaction came from Sarah Palin, who clearly misses the spotlight. She tweeted, "Common sense & decency absent as wacko 'church' allowed hate msgs spewed@ soldiers' funerals but we can't invoke God's name in public square." We can't? It hasn't stopped her yet.